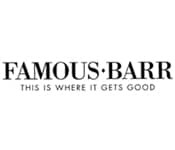 The Famous-Barr Co. (originally Famous & Barr Co.), St. Louis, Missouri, was a division of Macy’s, Inc. (formerly Federated Department Stores). It was formerly the hometown division of The May Department Stores Company, which was acquired by Federated on August 30, 2005. On February 1, 2006, it was subsumed into the newly created Macy’s Midwest division.